August 30, 2010, Shanghai World Expo welcome the National Day of Spanish Pavilion. 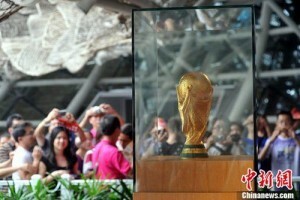 Spain brought a big surprise for the 2010 shanghai world expo – Jules Rimet Cup of 2010 FIFA World Cup. In July 2010, Spain took his first World Cup champion in South Africa World Cup, and the whole world were shocked by super technology and competitiveness in the determination of the Spanish national soccer team. This time the Spanish National Pavilion are still fortunate enough to bring it to celebrate Spain’s National Museum Day, and the Expo visitors from around the world can share the joy of winning together with Spain. The trophy was made in 1974, whose designer was a Italian sculptor named Silvio Gazzaniga. There are two human figures wngraved in this 18K gold trophy, and these two men scoope up the the entire planet. The base of the trophy was made in two layers of malachite, and winners of the World Cup since 1974 were engraved in it. This entry was posted on Thursday, September 2nd, 2010 at 11:21 am	and is filed under Expo News. You can follow any responses to this entry through the RSS 2.0 feed. Both comments and pings are currently closed.